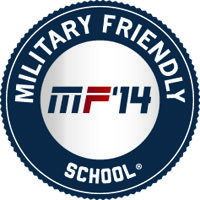 William & Mary has once again been named to Victory Media’s "Military Friendly Schools" list. The 2014 Military Friendly Schools list, released on Sept. 10, honors the top 20 percent of colleges, universities and trade schools in the country that are doing the most to embrace America’s military service members, veterans and spouses as students and ensure their success on campus. William & Mary's Mason School of Business was also included on this year's list. “ Our military and veteran students are highly valued members of the William & Mary family, and they are represented in all schools and at all levels of the institution,” said University Registrar Sara Marchello. “The University Registrar’s Office is proud to provide GI Bill certification services for nearly 250 members, veterans and dependents each semester, and we collaborate with a number of other campus offices to serve these students and others with military ties who do not use the GI Bill. The 1,868 colleges, universities and schools on this year’s list exhibit leading practices in the recruitment and retention of students with military experience. These schools have world-class programs and policies for student support on campus, academic accreditation, credit policies, flexibility and other services to those who served. W&M is home to an ROTC program that commissioned nine graduates into the military in May as well as the Lewis B. Puller Jr. Veterans Clinic, which in August joined the Department of Veterans Affairs Fully Developed Claims Community of Practice. The Puller Clinic was the first law school clinic in the nation to receive such an invitation. Now in its fifth year, the 2014 list of Military Friendly Schools was compiled through extensive research and a data-driven survey of more than 10,000 schools nationwide approved for VA tuition funding. The survey results that comprise the 2014 list were independently tested by Ernst & Young LLP based upon the weightings and methodology established by Victory Media. Each year schools taking the survey are held to a higher standard than the previous year via improved methodology, criteria and weightings developed with the assistance of an Academic Advisory Board (AAB) consisting of educators from schools across the country.